Cloud based brokers are likely to become very popular in the future for organisations they operate over a wide geographic area. In addition they provide a nice user interface making it very easy to setup your own broker instance and you don’t need to have to manage your own virtual server. 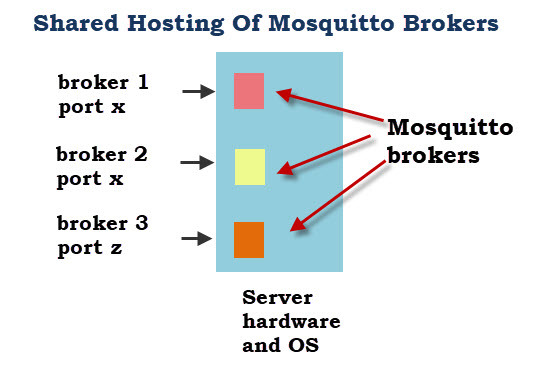 CloudMQTT like Amazon,Azure etc provide a managed cloud based mosquitto broker. 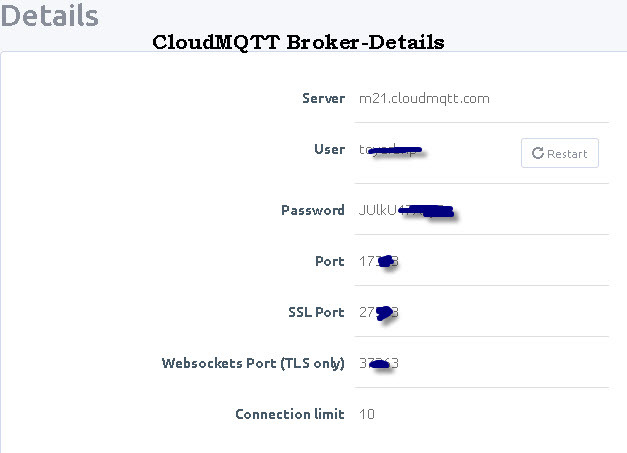 The plans on CloudMQTT are shared plans which means that several MQTT brokers run on the same hardware. The brokers are distinguished by the port numbers as shown in the diagram below..
To create a new broker instance click on the create instance button. enter the name, select the plan and also the data center then click create new instance. The instance will be created and you can see the details by clicking on instance name. Here are the details for one of my brokers. You will need the server name port numbers etc for configuring your clients. You can also manage users ,view logs and configure bridges from this panel as shown below. If you look at your instance details you also have a websockets port which must be encrypted. Cloudmqtt use a certificate signed by comodo and you need to download the root certificate from their website. Here is a video I created that takes you through the above. Here is a video showing you how to publish and subscribe to the Cloudmqtt broker. Q- Can I configure topic restrictions? Q- Do All client connections require a username/password? Note: If you want to run multiple brokers on your own hardware then take a look at this video –How to run multiple mosquitto brokers on the same host. Can I read values from serial port, send them to mqtt broker and display them in other divices in real time? I want also to store this data in a DB. you are trying to access the client class before creating it. If you use the Cloud Broker, is necessary install Mosquitto in raspberry pi, or in computer for e.g?? Or my Mosquitto hosted in the cloud is enough? If you use a cloud broker then you don’t need to install mosquitto locally. You will need to give your devices access to the Internet. However the main advantage of having a local mosquitto broker is that you can see status messages on the broker which helps when troubleshooting. what is the Client ID in this CloudMQTT? The client id can be whatever you want. Do you mean the broker name? If so you will get tat when you create the broker. How to select a topic name? Is the topic user defined? The topic name is user defined and You can use any topic name that you want.